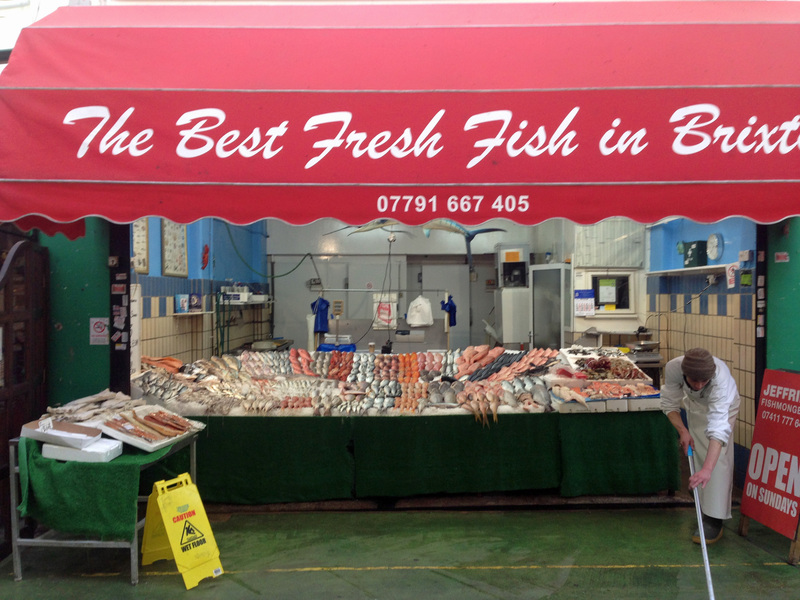 For some time I’ve promised myself that I will write about shopping for fish in Brixton. 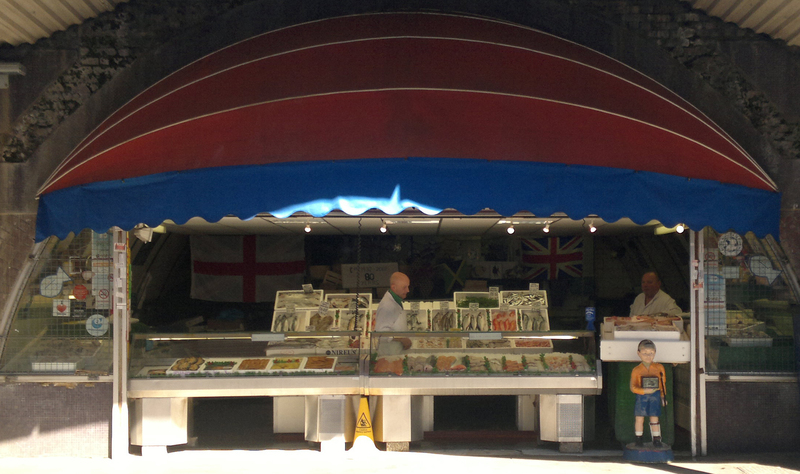 Because one of the most fantastic things about central Brixton is the number of fishmongers. 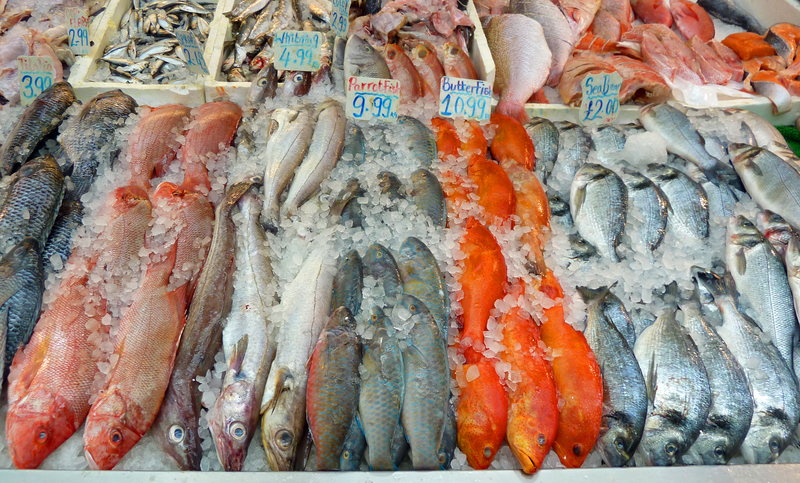 Across the country fishmongers have become an endangered species, largely replaced by supermarkets. But here in Brixton we have more fishmongers than there are in the whole of Hertfordshire. By this I mean proper fishmongers, where they offer a good range of types of fish with knowledgeable staff who will clean and fillet your purchases. This is great, of course, but it does pose a problem when you have to choose which shop to use. So, unlike earlier posts in our series about shopping, I’m not going to focus on a single shop. I’ve actually lost count of the number of shops in Brixton that sell fish but not all of them, in my mind at least, count as proper fishmongers. Quite a few of the Afro-Caribbean grocers sell some fish and there are others that specialise in fish but just sell it frozen, straight out of the boxes in which it arrived. I rarely use these, apart from the fish section in the Wing Tai Supermarket in Electric Avenue which is often useful, particularly for prawns. In practice there are just four that I use regularly and consider to be the real deal. These are L S Mash & Sons in Atlantic Road, Jeffries in Market Row and in Brixton Village, Harry Otto & Son and Ilias Fish Shop. L S Mash & Sons, 11 Atlantic Road: This shop in the railway arches is the most traditional and, usually, because of its location the most expensive. This is where I buy the smoked haddock that I use in my ackee and saltfish. That’s not authentic but it’s much quicker and tastier. I’ve always assumed that there’s a family connection with the erstwhile chain of eel and pie shops that traded under the Mash name. 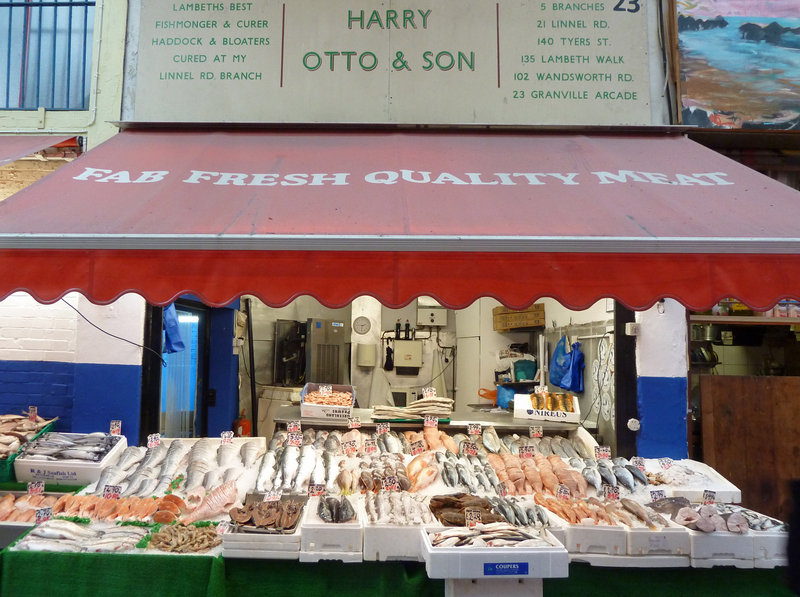 Jeffries, 5 Market Row: Just next to Franco Manca, this together with the other two in Brixton Village sell broadly the same range of fish.There was a while, a few years back, when the fish shops in the market had a relatively limited range, aimed more at the West Indian customer. But now the only reason to go elsewhere is if you want something really fancy, such as turbot, and are prepared to pay the price. In Brixton the prices vary all the while and you can’t necessarily assume that one shop offers better value across the whole range but prices here seem to be mid-range. Harry Otto & Son, 23 First Avenue, Brixton Village: As can be seen from the facia above the shop, this used to be one of a chain of shops across the north of Lambeth. But this is now the only surviving example, which simply goes to illustrate how Brixton is a special case. I’m not even sure it’s still Otto & Son as a inconspicuous note on a blackboard declares it to be “L&J Fish Shop”. Of the four this is the one I use the least but that’s more out of habit than anything specific I’ve got against it. This and Ilias are generally the cheapest. 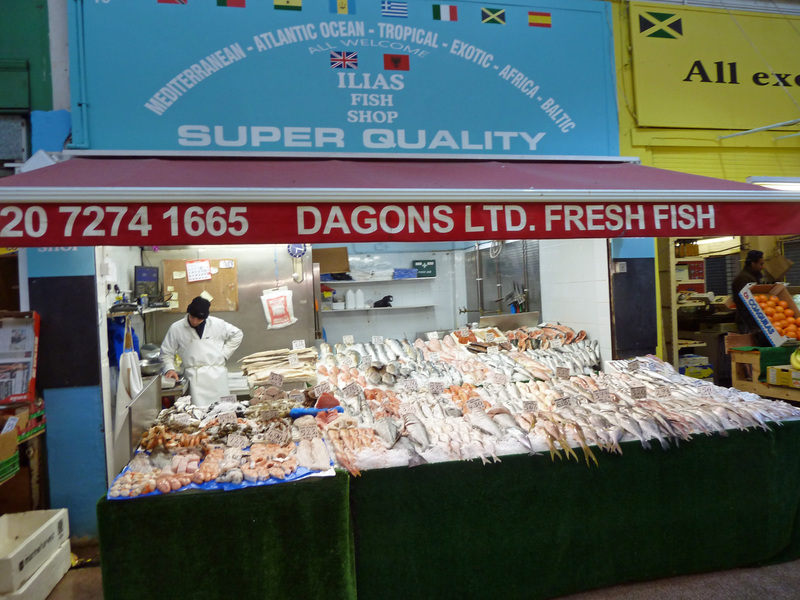 Ilias Fish Shop, 16 First Avenue, Brixton Village: – This is the one I have tended to use the most. It used to be called Dagon’s and there was a minor kerfuffle on Urban75 when long-time owner Gareth moved on – see here. But it still offers a good selection and seems to be just as busy, if not busier, than ever. Apologies to those who have been left out, as it does not necessarily mean that they aren’t any good. I’ve just focussed on those that I use regularly. My conclusion is that there’s not really much to choose between the four of them in terms of service or quality. There is a range of prices but my choice is generally governed by which is most convenient for that day’s shopping and whether the fish looks OK. With all the shops you still need to take care with what you are buying. I’m no expert but I did learn on a day’s course at Billingsgate Fishmarket to look out for bright eyes, bright gills, firm flesh with some slime and, most important of all, little or no aroma. In practice, of course, it’s not so easy to check all of these but I certainly don’t buy fish with cloudy or sunken eyes. What I also learned at Billingsgate was how to make what they call their Billingsgate Merchant Fish Soup. It’s really a classic Bouillabaisse but they don’t call it that to avoid any arguments. All the ingredients can be purchased in Brixton, including my favourite saffron at Brindisa, it’s relatively quick and easy and the end result is a sure fire hit with deep interesting flavours. The full recipe is on the Daily Telegraph website here, so I won’t repeat it. But It’s worth emphasising the importance of making a good stock first to get the depth of flavour that you want. This doesn’t take long and you can get the bones and heads you need as a base when you buy your other fish. Sometimes the fishmonger will let you have some offcuts for free, depending on what else you buy. An essential part of a Bouillabaisse is the slices of toasted baguette with lots of powerful rouille. The French sticks they sell at Wild Caper are ideal for this, toasted with a smear of olive oil, and the Billingsgate rouille recipe is great. Rouille recipe: Blend three cloves of garlic; a red chilli, deseeded; and a roasted red pepper, skinned and deseeded. I like the taste of a Scotch bonnet chilli for this and bottled roasted peppers work OK if you have limited time. Then you are meant to slowly blend in 6 tablespoons of pungent olive oil followed, a bit later, by 2 tablespoons of fresh white breadcrumbs. I find it works just fine if you just put everything together in a liquidiser. Finish off by adding salt and pepper to taste with, possibly, a little tabasco. The following photograph shows a version I made without mussels, because of a guest’s allergy, but with the addition of a few steamed potatoes. 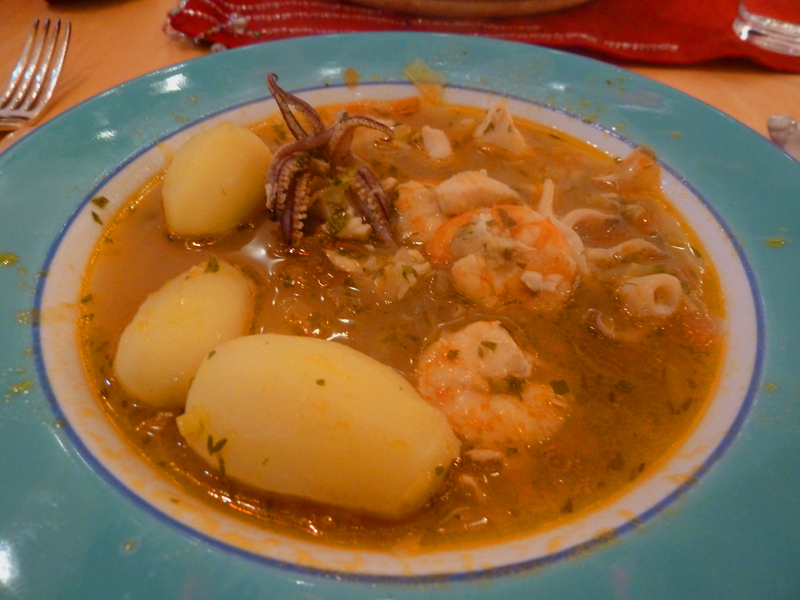 There’s no point in making only a little and, if any is left over, it makes a great fish soup when liquidised, in which case I would eat all the prawns and squid first.